The work you do every day in your district requires an understanding of many unique subject areas. The Support Professionals Program allows you to benefit from Illinois ASBO’s vast network of industry experts as you attend professional development opportunities catered to your needs. Whether you are new to your position or have a long history in your district, your completion of the Support Professionals Program demonstrates your dedication to working efficiently and effectively. Experience all that the Power of I has to offer at the 2019 Annual Conference! As a support professional, you are eligible to attend on Thursday, May 2, 2019 at a discounted rate. Network with fellow support professionals and earn credits toward your Support Professional Program Certificate while benefiting from a marketplace of solutions for schools! REGISTER TO ATTEND Annual conference! Apply for the Support Professionals Program! To ensure your district’s commitment to your success, you are required to obtain the support of your supervisor. Download the check list and keep it handy to review your progress in the program. Provide this justification letter to your supervisor to let them know how your enrollment in the program will benefit the school district. Designed specifically for bookkeepers and administrative office staff with sessions organized by a payroll and non-payroll track. 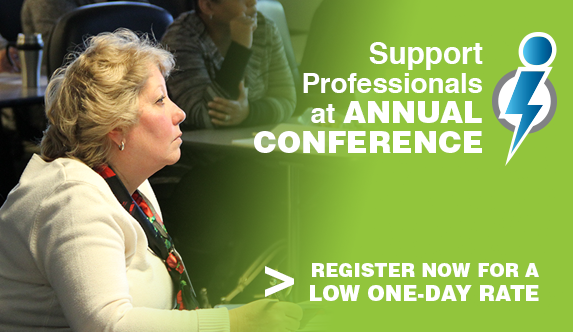 SupportCon offers support professionals the opportunity to learn best practices, network with colleagues, share ideas and more. Access a listing of all of Illinois ASBO's professional development offerings. Covering topics affecting business in the district. Updated monthly with business office deadlines. Member-only webinars count as electives toward program completion. The cost of membership is only $75. This means that if you attend at least two events annually, your membership has more than already paid for itself in reduced registration costs. Start your membership benefits today or contact Nicole Lee at (815) 753-9305 for more membership information.